© 2006-2009. Kamaron. All rights reserved. May not be copied or duplicated in any form. Click Here to Download a Full Version of this show. “We reframe the entire issue of of name calling and bullying to focus on the solution. This is the step beyond prevention. It is preemption,” explains program founder Margaret Ross. Classroom distraction minutes decrease fifty-five percent. This increases available teaching time, by 1 to 3 weeks without adding a single minute to the school day. 100 percent would recommend the program to others. “A research based, Bullying Preemption and Positive Character Program. It is proven to decrease bullying words and cyber bullying words, discipline, and distraction incidents. 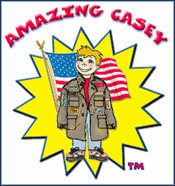 Behavior is more easily replaced than erased, explains Ross” The heart warming Casey stories (available on Amazon.com) provide the programs foundational language. Success Stories - KC3™ Citizenship in Motion Award © 2006-2009. Kamaron. All rights reserved. May not be copied or duplicated in any form. "Many ways – just a few teachers, bus drivers and students all reported that our learning environment has become a more friendly positive place to be. Name calling, teasing and saying mean things student to student has decreased. Teachers report other teachers saying more positive statements to each other. Teachers have been able to take the information from the program and use it in other areas of teaching. Any time a positive program comes along is a good thing. KC3 meets those requirements!" "The program connected the bus driver and the school together. Transportation and the school were using the program to achieve a common goal, for the good of children. "Drivers and Aides were encouraged to view the riders in a different way: not as 'cargo' to get from place to place, but as special people with varied and valued characteristics. This created a synergy never before experienced in our district." "This was a unifying program, bringing together students, staff, parents, and extended staff (bus drivers, cafeteria staff)." "The positive concepts taught in the KC3 Positive Label Program have become ingrained in the fabric of our school, benefiting our students, staff and community. "The After School Program has benefited in countless ways from the KC3 program. Our students gained a higher respect for not only others, but also themselves. The staff gained personal knowledge of the students' lives through our group meetings because the children felt safe in sharing their concerns with a small group. Our staff changed the way they handled problems, trying to focus on what the students could learn from the situation and how to turn the situation around and label the children positively. discipline." "It created a positive connection between school, bus and home. It gave students a positive way to interact with their peers and increased vocabulary knowledge! Because the program was school wide, it was reinforced in all the rooms that the students visited. Students spoke favorably about their bus drivers and bus rides. Students were focusing on the good of themselves and their peers. Improved behavior on the bus." "Decreased number of major referrals and parent notification forms, which has helped decrease negative behavior; a relationship vessel to allow transportation employees and school employees to work together to accomplish goals. "We primarily gained through significant improvement in our students' behavior. We had dramatically reduced discipline referrals and fewer driver distractions, which improved our safety." "The KC3 Program has helped me become aware of what I am saying. Sometimes when I am walking down the halls and I see all of the positive signs and doors it reminds me to be positive." "The positive label program is very necessary in middle school. This is the only chance that some middle school students have had to be the recipient of positive comments." "I like this program because it gives our students the opportunity to interact positively with one another." "Labels put a person in a box and say they can only do what the box limits them to." "People tend to take labels to heart as if labels can define who they are. Would you want to be responsible for the outcome of another simply by what you've called them? If so, make it positive!" "Sticks and stone may break your bones. But calling-names and put downs. They can really hurt a person." "Students are going to have a good day or a bad day depending upon how they arrive at school. Instances of bus distractions have decreased over 60 percent."